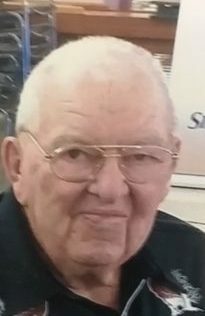 Glenford Wilfred Thompson, son of Wilfred Thompson and Vera Haddock, passed away at Stevenson Memorial Hospital on Tuesday, November 13th 2018 at the age of 93. Glen was born on Oct 25th, 1925 in Violet Hill. He spent most of his life in the Alliston area. His first job was logging and then he moved onto farming and trucking. Once Glen retired and the sold the farm, he spent his free time on a hobby farm breeding Belgium horses. He loved to fish and then turn his attention to wood working. Glen and his late wife Edith, married for 65 years, loved to go to the local dances. Glen leaves behind his children Vera Ellen, Danny, David, Dianne and Darrell and his 10 grandchildren and 5 Great Grandchildren. Glen is predeceased by his wife Edith Rebecca Gallaugher and his daughter Glenda Lee. Glen leaves behind his brothers Hugh, Bill, Bob and Don. Predeceased by his brothers Delmar, John, Bruce and his sister Verona. We would like to thank the nurses and extended staff from Simcoe Manor, especially the Innisfil wing where dad lived his last few years, for their excellent care. The Thompson family would like to invite family and friends to join them in celebrating the life and to share with us your stories of a kind, gentle and wonderful man, Glenford Wilfred Thompson. Saturday Nov. 24Th 2018 from 2:00 – 5:00 p.m. at Simcoe Manor in Beeton in the Chapel. 5988 8th Line, Beeton, Ontario, L0G 1A0. In memory of this wonderful man, donations can be made to the following organizations or one of your choice. Please write a condolence below. Upload Picture: (Allowed file types: jpg, gif, png, maximum file size: 5MB.